On Saturday, Marcus “The Cool Kid93" Redmond fought his way back through the losers bracket in Red Bull Battle Grounds’ Street Fighter V last chance qualifier for Capcom Cup, eventually securing himself the first-place trophy and a spot in the North American Regional Finals the next day. Redmond held his trophy aloft for the cheering crowd with tears streaming down his face—but there was a distinctive voice missing from the audience. Joy Goodwin, Redmond’s wife, has made a name for herself as one of the most vocal trash talkers of the fighting games scene. 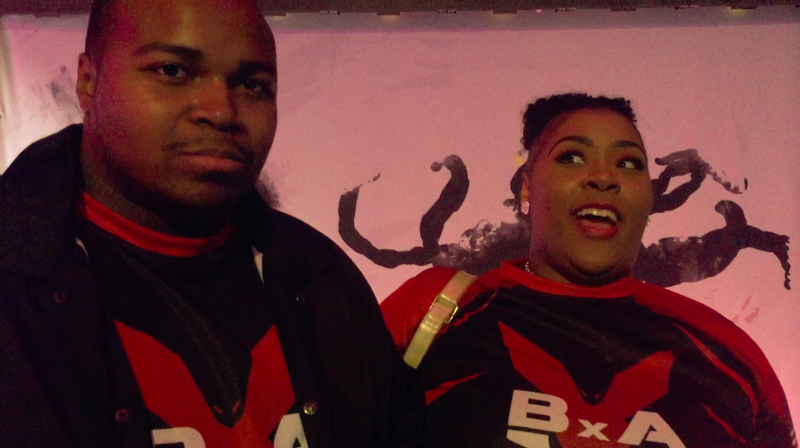 As soon as her husband had secured his spot in the regional finals, the tournament put her on an overnight flight from Chicago to Boston, knowing that her vocal energy would rev up the crowd during Sunday’s finals. After her husband lost this match as well, Joy Goodwin pointed her finger at his opponent, shouting at the top of her voice. Gustavo Romero smiled down at her, good-natured and unperturbed. It soon became clear there was no bad blood between them and the trash talk was all for show. After Romero left the stage, he and Joy Goodwin embraced and made conversation in their seats. When Victor “Punk” Woodley ended up placing first in the tournament, he thanked “The Cool Kid’s wife” in his acceptance speech, signaling that he also had no hard feelings. Joy Goodwin’s tough talk feels all the more charming when taken in contrast to her husband’s quiet demeanor—the “cool” in “Cool Kid93" is in the calm and focused sense. When he accepted his first-place trophy at the LCQ on Saturday night, Redmond thanked his wife and also God, assuring the audience through his tears, “I’ve been praying.” Redmond never talks trash, either. Whether he wins or loses, he often goes beyond the post-match handshake to offer a hug to his competitor. It’s all in good fun, though, hence the hugs offstage. Compete asked Goodwin if she considered all of these pro players to be her friends, and she insisted, “Absolutely. We’re all family.” And she’s a part of that family, too. “It is a blessing to have her here with me, basically at all the tournaments that I’ll be going to,” said Marcus Redmond, who tweeted today that he intends to take his cheering partner with him to “every event” going forward. His future opponents will just have to steel themselves for a two-on-one fight.